I have a Gammill Statler Stitcher Optimum longarm quilting machine. It can handle quilts up to 114 inches wide and any length. Your project can be quilted with a single all-over design, repeated in both directions (also known as edge to edge). This is usually the most affordable approach. Or it can be quilted with various different motifs throughout the quilt, which reflect either the subject matter of the quilt, patterns within the quilt-top fabric, or the blocks used in the quilt piecing. In this way the quilting tells the same story as the pieced fabric. (These 100% custom-quilted tasks are more expensive.) Or you can mix an all-over pattern with various individual motifs. Pretty much anything is possible. For example, you might have an all-over pattern in the middle, surrounded by custom quilted borders. 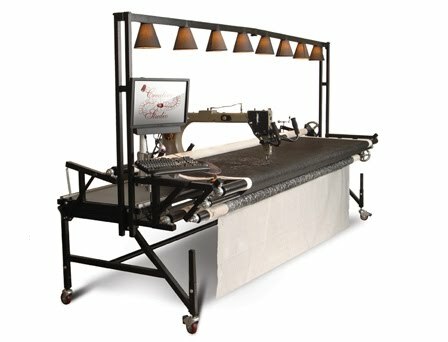 There are literally thousands of designs available for this longarm quilt machine. But if you need a design that doesn’t exist yet, I can create and program a new design for you. Quilts come in many styles: formal, semi-formal, casual, folk-arty, abstract, relaxed, geometric… With these thousands of quilting designs to choose from, the quilting on your project can match the style of the pieced top, so it “continues the story” told in the piecing. We can work out the quilting design collaboratively, or you can let me “run with it” and I’ll design the quilting for you. And, yes, I can do stitch in the ditch with my longarm! (Many longarm quilting services don’t offer this option.) Note that because stitch in the ditch is time-intensive, it is priced as “custom” quilting. The size of your quilt. The complexity of the quilting. The density of the quilting (how closely spaced the quilted lines and curves are). Quilting with a single all-over design is cheaper than doing custom quilting which varies across the surface of the quilt. My prices are competitive for the Okanagan area. I’m happy to provide rough estimates, if you email me some photographs of your quilt.